This is a 1929 2-page ad for a American Seating No. 104 Steel Adjustable Pedestal Desk and Chair; No. 174 Adjustable Universal Tablet Arm Chair; No. 114 Steel Desk and Chair with Lifting Lid Top; No. 135 Adjustable Universal with High School Top featuring Roosevelt High School, Oakland CA; Claussen Junior High School, Oklahoma City; Liberty High School, Bethlehem PA; Manitowoc High School, Manitowoc WI; George Peapody Demonstration School, Nashville TN! The size of the ad is approximately 13.5x20inches. 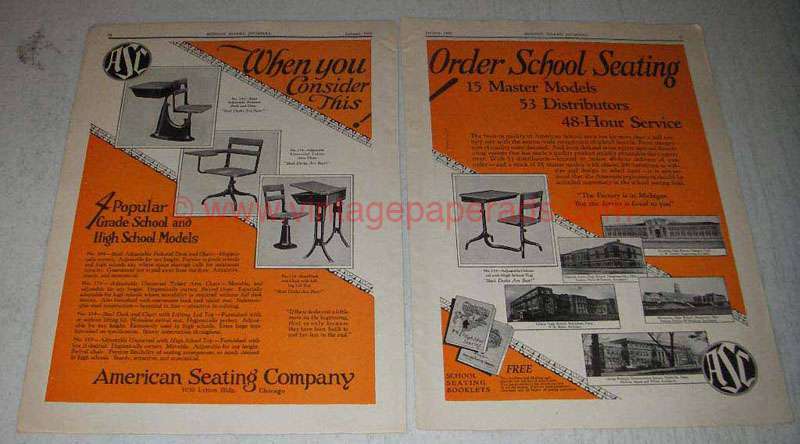 The caption for this ad is 'When you order school seating consider this' The ad is in good overall condition, with some light wear. This vintage ad would look great framed and displayed! Add it to your collecction today!